A quitclaim is a simple form of property transfer deed. It states that the property owner (grantor) quits his legal title and conveys it to a named grantee. A quitclaim offers no warranty that the grantor's title is good or free from liens, or even that the grantor owns the property at all. The risk of acquiring property by a quitclaim lies entirely with the grantee, who has no legal recourse if the quitclaim goes wrong. For this reason, quitclaims tend to be used for specific intra-familial transactions where no money changes hands, such as adding a spouse to the title. They are not generally intended for use with mortgaged property. Real estate is transferred by deed. Deeds take various forms, but all contain the same basic information. A transfer deed will always specify the name of the person handing over title to the property (grantor) and the name of the person receiving it (grantee). It will contain the address and a legal description of the property being transferred. Add in words of conveyance and valid execution in accordance with state laws, and you have done enough to move title. Quitclaim deeds are seldom used in property sales for value, as they make no warranty that the grantor has title, or holds that title free and clear of all liens, or has the right to transfer the title at all. Can I Sell My House with a Quitclaim Deed Only? What does a quitclaim do to a mortgage? Nothing -- and everything. Signing a quitclaim does not change the fact that the grantor is accountable for the loan. If you were named on the mortgage before the quitclaim transfer, you will still be named on the mortgage after it. The problem is, the majority of today's mortgages come with a due-on-sale clause. This gives the mortgage lender the right to call in the entire loan when the homeowner sells the property. Due-on-sale clauses protect the lender; without a due-on-sale clause, the mortgage lender could lose their collateral for the loan. The intention is that a homeowner use the proceeds of his house sale to repay the mortgage loan. With a quitclaim transfer, there is typically no sale. However, the name "due-on-sale" is a misnomer; usually, the lender has the right to require full payoff whenever the grantor disposes of his interest in the property, regardless of whether the disposal is for value. Put simply, a quitclaim transfer triggers the due-on-sale clause. 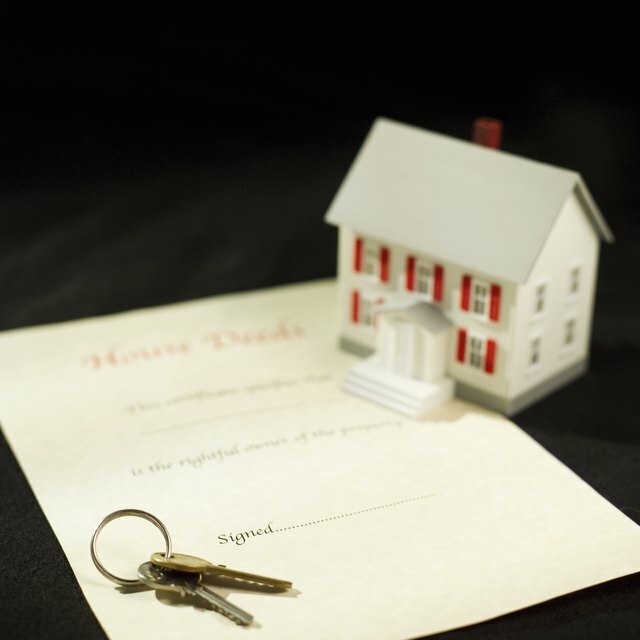 Quitclaim deeds are typically executed when the property is transferred for reasons other than sale. Perhaps the owner marries and wants to add his or her spouse's name to the title. Perhaps the quitclaim is part of a financial settlement consequent upon divorce. Whatever the reason for executing a quitclaim, it is unlikely that the grantor will be able to pay off the outstanding mortgage if the bank calls it in -- there are, after all, no sale proceeds. If the mortgage lender enforces a due-on-sale clause, the grantor could be financially very exposed. If the bank forecloses because the grantor has not paid off the loan, the grantee will lose her home. A grantor may take the view that his mortgage lender will not enforce the due-on-sale clause and proceed with the quitclaim without notifying the lender. The problem comes when the mortgage payments are not being met. If the grantor has quitclaimed his house on the understanding that the grantee will make the mortgage payments, the grantor is very exposed if the grantee stops paying. There is nothing to stop the grantee from selling the property or further quitclaiming it, leaving the grantor with no means with which to pay the monthly mortgage and no property to leverage for funds. A possible way to quitclaim a mortgaged property is if the grantee assumes the mortgage. The lender must agree to this, and will typically only do so if it is satisfied that the grantee can meet the loan repayments. Alternatively, the grantee could refinance the property and pay off the original loan. It might be possible to gain the bank's consent to a quitclaim transfer without the grantee assuming the mortgage, though typically this is only an option for grantors adding another person to the title, rather than disposing of the property entirely. If the grantor secures such consent, but has agreed with the grantee that he or she meets some or all of the mortgage payments, the best advice is to draw up a legally enforceable agreement documenting the terms of payment. The grantor then has protection if things go wrong. Law Dictionary: Can I Legally Quitclaim Deed My Home to Another Person While I'm Still Paying Off My Mortgage?